As the athletic sub-freshman, on her last day at home, polishes her golf-clubs and packs her racket among her chiffons and muslins, she has her own pet dream of college glory: a multitude of eager faces focused upon her, tense dramatic moments, a breathless climax, and a tumult of ap­plause. It is a good dream. Nowadays this out-of-door young person, glorying in her strength and muscular skill, is frankly welcomed at any woman's college. Her influence is recognized as a balance that keeps the in­tellectual emphasis from swinging past the danger-line. In the composite of college ambitions hers plays a vital part. And she wailed, 'A condition have I! '" Now a condition, or even a low grade of work, in a woman's college usually shuts the athlete out of paradise. With that blight upon her she is a pawn, a nobody—hers only to watch with wistful eyes, while others win or lose the athletic laurels for her class. Such a possibility gives the muscular and ambitious freshman no encouragement to mental naps. Her classmates, who regard her as the star of their athletic salvation, as well as her own de­sire, spur her on to keep above that fatal level of "poor work." But the bookish girl is another kind of problem. With an ancestral sense of duty behind her and a serious purpose before, she looks on college as an intellectual op­portunity. She is fear-ridden with the thought of not giving "every flying minute something to keep in store." Intellectual Oliver Twist that she is she takes all the work she is allowed, and cries for more. She cannot grasp enough of this transient feast of reason to satisfy her appetite. Students warn her, teachers warn her, the college doctor protests. Then one day her doom is pronounced—"overwork, nervous prostration"; and during a period of enforced idleness she adds a new proverb to her working philosophy: "Half a loaf is better than none. As colleges for women have grown in years and experience, they have come to recognize more and more the need of physical training for their students, to keep pace with the mental. While the catalogue of requirements and electives has been growing from three pages to twenty, physical development has had its due share of attention and expansion. As a result, courses on hygiene have become a compulsory part of the cur­riculum. The ladylike gymnastics of an earlier period, which did no harm and lit­tle good, have given place to departments of physical culture, and to scientific exer­cise administered by instructors as expert in their own line as professors of Greek are in theirs. Whatever her college, the bookish girl may not sweep into a breakdown un­checked. Required "gym" work meets her at the outset, and only providence in the guise of the doctor's excuse can save her from it. So much of a safeguard every college provides. But in forming the nor­mal young person who works well and plays well, experienced faculties now real­ize that required gymnastics, however valu­able they may be, will hardly arouse, of themselves, the enthusiasm for physical activity which makes preeminently studi­ous girls healthy as well as wise. That is why all the colleges for girls provide opportunities for physical recrea­tion as well as for physical work. The strong young fresh­man, with her racket and her golf-clubs and her enthusiasm, finds not only courts and links, but a dozen other ways besides of working off her muscular exuberance, unconscious that her mission is to act as leaven on her less energetic companions. In the larger significance of athletics for girls each college has developed its own picturesque climax and test of physical ability. At Vassar, field-day in the spring is the focus of many athletic hopes and ambitions. Interclass basket-ball matches set the whole college on tiptoe with ex­citement, and the championship is a prize indeed; but field-day, with the sanction of long custom upon it, seems to outsiders, at least, even more the characteristic expres­sion of Vassar's athletic spirit. It falls on a certain Saturday in late spring. The grassy Circle, hedged in with evergreen, is the arena, and gathered to watch the struggle are throngs of chattering college girls bran­dishing their class colors, dozens of alumna hardly less excited, and a sprinkling of mo­thers, little sisters, and other feminine guests. One-hundred-yard dash, 220-yard dash, relay race, running high jump, running broad jump, standing broad jump, fence vault, basket-ball throw, base-ball throw, putting the eight-pound shot—all these things are on the Vassar field-day pro­gram. The records are surprising as an illustration of what girls can accomplish; but the physical achievement of the day is not all. In the scheme of college de­velopment that interclass struggle for the championship has another significance. A pink V on a Vassar girl's sweater means that she has broken a record. Sym­bol of ability, key to many of the good things of life, the athletic freshman longs for this letter with all her soul. She works for it by day and thinks of it by night. At last the dream of her sub-freshman days comes true. On field-day she makes her debut. She stands for one dreadful moment, with the emerald of the Circle, the waving flags and streamers, the hundreds of figures, blurring into one mass of color before her frightened eyes; then she shakes off the weakness and faces the ordeal with tightened lips and paler cheeks. She takes the hurdles one by one. With brain of fire, throat of parchment, feet of lead, she makes a last spurt into the arms of her friends be­yond the tape, and breaks the record. The freshmen let loose pandemonium. The class-cheer bursts forth, and the winner's name rings out at the end. But in the mo­ment of her triumph, with the excitement and enthusiasm surging about her, her first exultant thought is not, "I've won my V," but, "I've helped my class." An ambition wider than one's ego—that is what a college contest helps to teach its girl participants. It is a charge as old as Plato that a woman is inclined to look at the universe in terms of herself, to bound her horizon by a personal point of view. If athletics, then, can teach a girl to work for her class first and herself afterward, it is not a small achievement. This development of class loyalty is one of the incidental blessings, also, of the great basket-ball game at Smith between sophomores and freshmen, which, like field-day at Vassar, is the characteristic athletic event of the college. The game takes place on a Saturday afternoon in the gymnasium, just before the spring vacation. The result of months of work is staked on a single throw, and the climax is fittingly dramatic. No girl appears without her colors, and the gymnasium galleries blos­som like a garden with flags, ribbons, flowers, and sashes. Even silk curtains are appropriated with the eagerness of class zeal, and the class animals in various guises give humorous touches to the decorations. The freshmen and their junior friends are on one side, the sophomores and seniors on the other. Original songs, appropriate and eulogistic, set to familiar tunes, are sung first by one half, then by the other, in a merrily taunting antiphonal. Even the cross-beams are fringed with eager specta­tors. There is not an inch anywhere ex­cept down-stairs on the platform, where the faculty sit, the president in the middle, adorned impartially with a huge rosette of each contestant's color. Then the teams file in, with the most original thing they have been able to find in the line of mascots. The whistle blows and the game begins. Very often the sophomores, by virtue of their better endurance from the extra year's practice, are the victors; but the contest is close and the issue by no means certain. As the second half rounds to a triumphant finish, the excitement is at fever-heat, and breaks into jubilant songs at the end. With a mighty rush from the gallery, eager classmates lift the winning captain to their shoulders, and not until after the supper for both teams that night does the enthu­siasm cool to sober joy. Basketball at Smith is the straight road to athletic distinction. Happy is the fresh­man or sophomore who makes her class team. But it is not an empty honor, as any Smith girl will tell you. She must work like a Trojan to get her place, and to keep it when she has won it. After the first of November she must trudge over to the gymnasium four times a week for a half-hour's practice. If she is ambitious to be on the team, the game with her gymnastic division on Fridays is only the beginning. She plays basket-ball on Wednesdays and Saturdays when "gym" is not required; she plays on scrub teams, and she has bouts with the big ball by herself ; she thinks about it between-times, and dreams out new manoeuvers. As soon as the teams are chosen by the head of the gymnastic department, with the help of the interested upper-class girls, work begins in earnest and in secret. No outsider can even get an eye at a crack when the teams are playing, and they practice signals, new ways of passing the ball, and all the lawful tricks they can contrive without fear of interruption. Constant practice is not the only obli­gation put upon a member of the team. No one watches what she eats, but she is on her honor to con­fine her diet to whole­some food. She must forswear candy, des­serts, and all other indigestible luxuries. She must go to bed at nine o'clock; and if she is literally conscientious and faithful, like one of the captains a few years ago, no temptation will keep her up beyond hours. Even when all the college world and their adopted brothers are at the opera-house enjoying the Glee Club concert, which is one of the great social events of the year, she will rise and march out when the clock strikes nine, and commit herself to dreamland cheerfully. Bryn Mawr, like Smith, is a special dev­otee of basketball, and around that game centers the ambition of every athletic girl who is not barred from playing by the careful doctor. The difference in rules makes Smith basketball and Bryn Mawr basketball very unlike. Smith plays in­doors, keeps each group of players in its own section, and does not permit grap­pling for the ball. Bryn Mawr plays out of doors, without inter-court bounds, after the unmodified rules which allow taking the ball from one's opponent. The Smith game is very swift, and develops excellent team work. The Bryn Mawr game, on the other hand, is less rapid, and relies more on the individual player. Basketball at Bryn Mawr is played in the fall for the fun of it; but in the spring serious practice begins on the wide, ample field at the foot of the hill. The compe­tition is open to the whole college, and the champion class must prove itself the best of four. Game after game is played in the basketball tournament. Interest grows more and more intense as the choice narrows, until the final game, when one team makes the struggle of its existence and wins the championship. Then the storm of enthusiasm bursts. Cheer follows cheer until throats are hoarse and breath is exhausted. At last the triumphant team is carried away to celebrate, and the defeated classes gather themselves together and hope for better luck the next year—unless they are unfortunate enough to be seniors, with no hope of retrieving themselves. At Wellesley, field-day in the fall is a fillip for the enthusiasm of the girls whose interest is in field-sports. Basketball is popular among the seven "organized" sports, which collectively claim a mem­bership of three hundred and fifty students. Tennis, golf, field-hockey, low hurdling, relay-racing, and basketball, six of the magic seven, all have their enthusiastic supporters. But rowing is preeminently the Wellesley specialty. "Float" is its climax and reward, the picturesque water contest which has been the pride of students and the joy of beholders from the earliest days of the college. The preparation for float is arduous. It means winter exercise in the gymnasium, tiresome preliminary practice at the rowing-machine before the candidate is permitted to touch an oar to water, and, lastly, prac­tice on the lake. But practice plus ability wins a girl the right to row with the other seven for the glory of her class. On a June afternoon comes the beautiful sequel of all these toiling hours—that rhythmic procession of boats that sweeps up and down while thousands of friendly eyes watch from the bank. 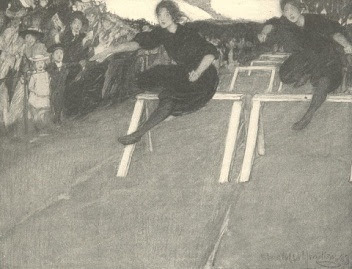 The winning crew is judged by its skill and form rather than by its speed. Afterward the best of the individual oarsmen in all the crews are chosen to row in the varsity crew, and proud indeed is the class that has the most representatives. Holyoke's well-equipped gymnasium, one of the best provided for college girls anywhere, holds out strong inducements to athletic students. All kinds of appara­tus tempt them to try feats of strength and skill, and an indoor meet, when all these exercises are performed before an apprecia­tive audience, gives point to their efforts. An indoor basketball tournament between the classes, with the usual class-color dis­plays and the accompanying war of song, is sufficiently absorbing to keep college attention at a high pitch until the game between the two final contestants decides the championship. 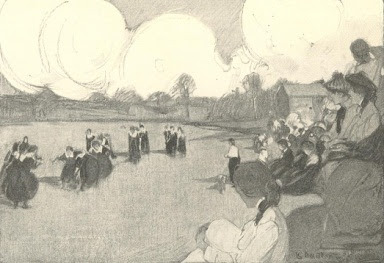 An out-of-door meet, also, is usually one of the events of a Hol­yoke spring, and although it is not so formal an affair as the one at Vassar, it represents the same encouraging interest in athletic activity, and has the same lively attraction for spectators and contestants. To the student mind in general the vari­ous stirring contests which decide the superiority of one class over another are the goal of all athletic desire; but to the physical directors of the colleges, field-days, indoor meets, outdoor meets, basket­ball games, float, and the rest, are only the dramatic recognition of work the value of which lies in the doing rather than in the reward. They make the spur and in­centive for the exercise which stores up, for the faithful, health and strength as well as athletic honors. About this required exercise, which is made the preliminary for all athletic events, each college has its particular theory, its own method of practice. Three half-hour periods a week for gymnasium work is the allowance which the Holyoke girl must make in her schedule. A combination of the German and Swedish systems leads her in the athletic way she should go until she is a senior, when she is released from com­pulsory work, with the reasonable hope that she will take what she needs. Recently the requirements have been widened to in­clude four periods of out-of-door exercise in the early fall and in the spring when there is no work in the gymnasium. At Vassar the Sargent system is in use, and for the first two years of her course, from Thanksgiving until the spring term, a girl is required to take one half-hour period each week for class work, and two for in­dividual work with the apparatus, correct­ing her defects and strengthening her good points. Three periods weekly are required also of juniors and seniors, but the kind of work is left optional, and they may substi­tute basket-ball or swimming for gymnas­tic drill. At Smith the Swedish system of gym­nastics holds sway. Beginning with the simplest exercises, it carries the student on to the most complex, with the inevitable logic of physical evolution which makes the great excellence of the system. Through the fall and winter four periods a week of gymnasium work are required of the first two classes. Juniors and seniors are now obliged to take out-of-door exercise. They are exempt from required gymnastics, but many of them show their appreciation of the work by electing it or by entering the classes in fencing or esthetic gymnastics. An interclass competition for a cup and banner puts a premium on the achieve­ments of this department, and keeps the in­terest of the students fresh and effective. Bryn Mawr, in its early days of trustful­ness and inexperience, decided to exact no required gymnastics of its students. "We will rely on their common sense," was the thought of the faculty, if not their com­ment. "They will know what exercise they need, and take it." But alas for their belief! Bryn Mawr's daughters sat the day through with no uneasy pangs of their ath­letic consciences, and a system of compul­sory exercise was forthwith introduced. The system is, however, a special Bryn Mawr invention. One hour a week in the gymnasium for corrective work is obliga­tory; but by a theory of substitution the rest of the periods may be worked out as a girl's athletic fancy dictates. Driving, walk­ing, skating, basket-ball, tennis, hockey, or swimming are the alternatives. The time value of each is graded according to the vio­lence of the exercise. Every day's equiva­lent must equal a period, and gymnastic work is raised to the dignity of the intel­lectual part of the curriculum by a rule that "gym" cuts shall be made up like any others. Wellesley requires gymnastic drill of its students, as other colleges do, for the first year; but of late it has been laying special stress on the recreative side of athletics. "Girls who don't know how to play must be taught to play," is the motto. The ath­letic director, believing heartily in the benefit of self-forgetful exercise, has been making a determined effort to infuse enjoy­ment into this particular performance of Wellesley duty, and to wake up those in her charge to the pleasure of sport for sport's sake. The trustees have begun to see the matter from the same point of view, and have provided not only a gymnasium and an athletic field with a fine cinder track, a boat-house, and tennis-courts, but playgrounds and a bath-house as well. They also provide instruction in the various sports, as they do in gymnastics, and ex­aminers to look out for the health of the participants in the games, just as they do for the members of the gymnastic classes. This is an interesting development of girls' athletics, and a phase in which Wellesley is the pioneer; for while other colleges have recognized the benefit of enjoyment in ex­ercise, they have not made an organized effort to secure it. However colleges may differ in athletic creeds and doctrines, the aim of all is the same—to make girls stronger and healthier. Unless carefully gathered statistics are to be utterly discredited, all colleges are at least partly accomplishing this aim; for the average of health throughout the women's college world is vastly better than it ever was in the days of nondescript, take-it-as-­you-please exercise. The increase of interest in voluntary exercise and athletics among girl students should be most encouraging to those who desire their symmetrical development. No college now feels itself complete without a student athletic association, usually a strong, robust organization, and a center of encouragement for all forms of physical activity. Tennis and golf, with tourna­ments to lend spice to practice, are so in­evitable in any college calendar that their absence alone would cause remark. 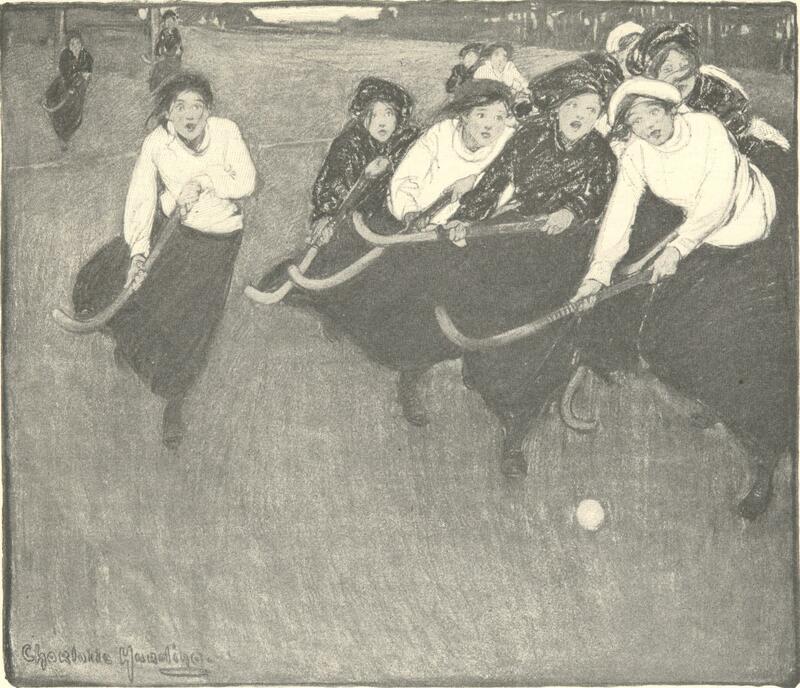 Since an enthusiastic Englishwoman made a pil­grimage to the colleges to preach the joy of field-hockey, Holyoke, Vassar, Welles­ley, Smith, and Bryn Mawr have all suc­cumbed to the spell of the game. Wells College provides ample opportunities for exercise. Radcliffe has a flourishing ath­letic department, Barnard one in embryo. The girl students as well as the men of Chicago University, the University of Cali­fornia, and Leland Stanford have a vigor­ous interest in gymnastic work, in basket­ball, and in other sports. College girls sometimes break down. So do society butterflies, and wage-workers, and hundreds of other girls who have not the wisdom or experience to establish a just relation between their physical in­comes and outgos. But it is over-worry much oftener than overwork that sends the college girl or her non-collegiate sister into nervous prostration. Just here is the saving grace of athletics, that sugar-coated ounce of prevention that prevents the bitter pound of cure. In the rush and whirl of some exercise that uses every muscle and requires each instant the judgment of an alert mind, there is no room for the little blue demon of worry that eats into the foundations of health; the perplexing problem is forgotten; the player gains her poise and takes up the next task with a freshened brain. The physical benefits of judicious ath­letics are almost axiomatic. But they are not all. 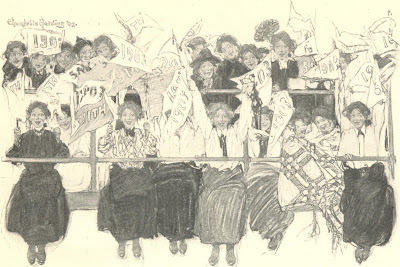 In the education of girls the inci­dental lessons of college contests are not to be despised—the value of patient work for an uncertain end, the sweetness of ef­fort for the class, the grateful weariness of victory, and the pleasure of a just reward. 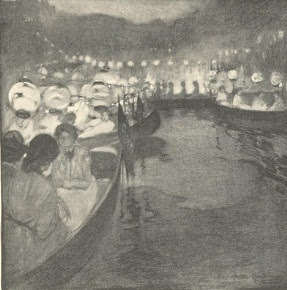 From Munsey’s Magazine – 1903.